Salt, palm fat, potato starch, flavour enhancers (monosodium glutamate, disodium inosinate, disodium guanylate), chicken fat (5%), flavourings, spices (onion, CELERY seeds, turmeric, garlic powder), chicken (0.9%), yeast extract, caramel syrup, maltodextrin, parsley, antioxidant (extracts of rosemary). 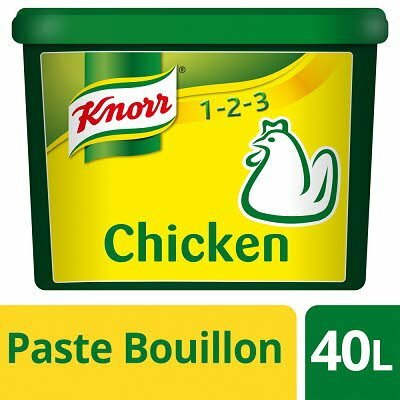 Pour 1 litre of boiling water onto a dessert spoon (22g) of Bouillon Paste. Stir until dissolved. IMPORTANT - Keep tub tightly closed in cool dry place.